When it comes to SEO there are a lot of well meaning but under-qualified people willing to offer what they think is an approach the Google gods will find favorable. But as we all know, a little knowledge can be a dangerous thing. So whether you are new to SEO or want to hone your skills, we strongly suggest you turn that overused acronym into a rally cry to Seek Expert Opinion. At Bloom, we specialize in creative marketing solutions, which includes optimizing performance. Though we are not SEO experts, we are smart enough to partner with specialists and heed the advice from gurus like Neil Patel and Eric Siu. It takes roughly 12 months, but you’ll notice those cornerstone pieces of content will rank higher. Have a similar effect and great real estate to take advantage of. If you don’t know what those terms are — log into Google Search console, enter those terms into tools like Ubersuggest, Keyword Tool, or KWFinder to find the long-tail phrases and put them into the page that is ranking. But don’t just shove in the keywords, modify the content so it flows nicely. Then in 30-60 days, you should pop up on page 1 for all of those terms as well. Dwell time is an SEO factor, and some people prefer to listen. Google is ranking people with higher brand queries higher. An excellent way to increase your brand value over time is to make sure people return to your site, so they are familiar with it. To do this, you can collect emails, exit pop-up stopper, push notifications, chatbot subscriptions and mobile monkey. When you leverage all of these tools every time you post a blog or release a new product or service you can push it out on all of these channels. It will help people get more familiar with your brand and build better brand queries over time. Use this to embed other people’s videos, but have the subscribe button link to your channel. This can be effective but risky if they subscribe but don’t engage. Your YouTube authority score can go down, and you will find your videos won’t do well. It’s so much easier than traditional SEO, and it’s not competitive. You don’t have to go to a studio. What you want to do is take that iPhone video, put it up on YouTube, send it out to your email list, your push notifications, your chatbot list. If you get a lot of traffic in the first 24 hours that video will rank highly on YouTube. And, of course, be sure to do the basic optimization stuff like: include the right keywords, have a description, upload an SRT file you can get one from Rev.com for all of your videos. This will ensure that your video will rank. But the big trick is you need to make sure the video is popular in the first 24 hours. So, you want to push hard on all of your other channels to drive traffic to it. This episode is just one of the reasons I subscribe to this podcast. 6-minute marketing soundbites for busy professionals can fit into your schedule at any time – gotta love that. 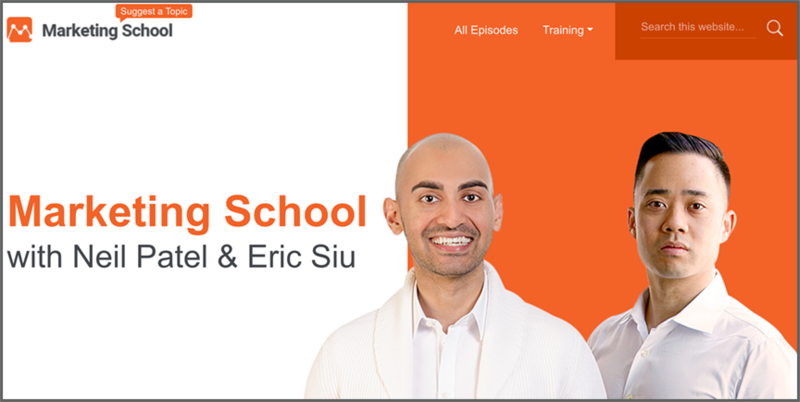 But if you need another reason, Neil and Eric have committed to throwing a Free Marketing School Live Event in Los Angeles, once Marketing School reaches 1M downloads in 30 days. You can track their progress here and help them meet their goal. I hope this article has provided a few helpful considerations when embarking on your optimization quests and how important it can be to seek out the experts that will ensure optimal success.